While car camping this past weekend, I bought some firewood from the park headquarters but unfortunately, it was split into very large pieces that obviously wouldn't light very well. I tried splitting it by using a hatchet and another log to hit it, but this wood was very hard and not splitting using this method. That said, I've always been hesitant to use a hatchet with full swinging power, which is probably what this log needed. What is a safe and effective method for splitting hard firewood logs using a hatchet? I normally baton with a large knife, but the principle remains the same (driving a wedge to split the wood). I taught myself how to baton in order to quickly make kindling from larger sections, often quarter-rounds, while my little cousin was around. Batoning can be performed on logs or thickers sticks, depending on your needs and the size of your wedge. I often find myself hacking up sections of fallen branches before batoning them into usable kindling. Select your wedge (axe), baton (a piece of wood or plastic that fits comfortably in your hand), location (harder ground or rock, but not concrete, as it can crack), and wood (firewood, branch, etc). Position your wood and wedge. Where your wedge's blade goes will depend on what you're splitting. You may be able to go straight through the center of a small-ish branch (like this). In the case of logs, I tend to remove lengthwise corner sections (like this). Once you've positioned the wood, wedge, and have your baton in hand, begin batoning. To baton, treat the action like you're hammering a nail. Swinging too lightly won't get you anywhere, while swinging too hard initially may displace your wedge from your wood. Once the wood has been split, rinse and repeat steps 1-3 to make smaller sections of wood or to process other pieces of wood. The main reason for focusing on smaller sections of the wood/log is that it helps prevent one of the biggest problems that improper batoning has: getting your wedge stuck. This is why the majority of people who baton use a knife of decent size (more blade spine to baton while processing the wood). If the wood is not split by the time your wedge has sunk fully in the wood, you're going to have to remove it (this often involves a groan, a smattering of grunts, and usually a few expletives) and try a different position. After processing a few bundles worth of wood, you'll likely get the feel for what will, and will not, nicely split. Safety concerns of baton selection: Batons should not be made of metal. I cannot stress this enough. Metal-on-metal contacts can damage your wedge and creates a safety hazard, such as flying shards. I have personally had to remove a few shards from the arm of my jacket when I was tired and absentmindedly used the back of an older camp axe as a baton. General safety: While this may seem safer, you are still swinging a solid object and working with a blade. Treat anybody who's batoning with the same considerations you would give to somebody swinging an axe. Let me know if I left anything out or need to clarify anything. I have ruined more than one hatchet in my lifetime trying to split large logs in half. The trick is to not try to spit them down the middle as you would with an axe, but to chop around the edges of the logs and split off smaller pieces all the way around, making the log smaller and smaller as you go. One technique is to make "helper" chops in the top around the edges, along the radius of the cut in the log, to sort of pre-split your wood. Make your helper chops no further apart than your hatchet blade is broad, then chop into the top perpendicular to them and use your hatchet as a lever to pop the chunk out of the side. 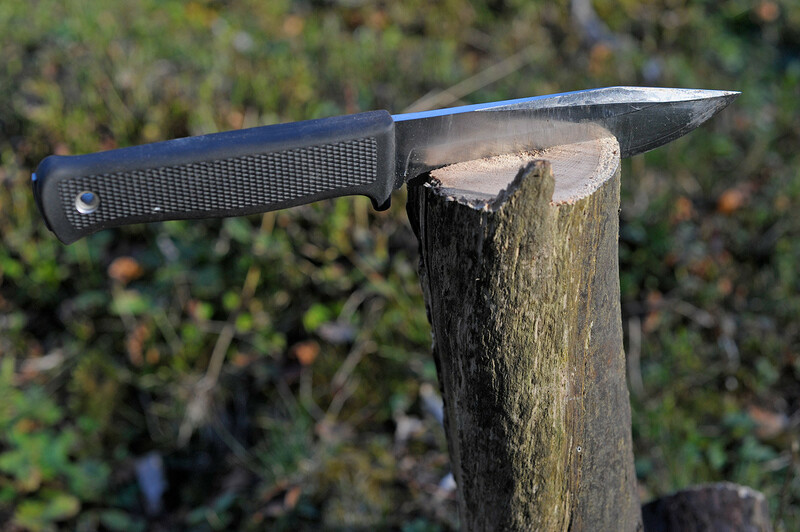 The problem with a hatchet is that it is quite light weight, so there is not a lot of force available for splitting logs. The trick here is to inverse this scenario, so that the weight of the log will work in your favor, i.e. do the splitting for you. 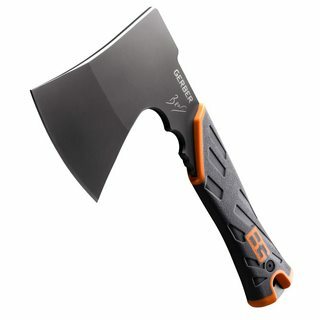 This will make the entire weight of the log work in your favor, instead of only the comparably light axe head. The block can fall of/fly away if it is not firmly stuck to the blade. So don't overdo your swings and keep clear of people. Never hit your axe head on a rock. Use a chopping block/log or similar. If your log is too big to fully split when your entire axe head is buried in the log this technique will not help you and you will have to get your axe 'unburied' from the log which can be a pain. In general, the splitting force necessary to split firewood depends on the length of the wood, the width of the piece, the species, the knottiness/curvature, pre-existing stresses, and the degree of moisture. Additionally, machine-split wood tends to fracture where it went through the grate/splitting cross and not along the grain of the wood, making it often quite tough to resplit, but offering opportunities to knock off pieces from the corners. These problems with camp wood are much more likely to happen with hardwoods on the East Coast of the US than with the softwoods found elsewhere. 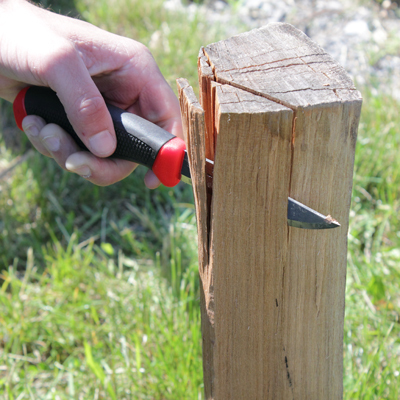 A hatchet is not designed to split wood; it is designed to cross-cut chop chips out of logs. It is much closer to a felling axe than a splitting maul. Use the hatchet to chop each piece of wood in half widthwise, and then chop those smaller pieces lengthwise (shortens length, reducing force necessary). Find an area where the grain is not parallel to the length of the log due to the log having gone through the splitter at an angle. Split there -- this shortens the effective the length of the log. Make small chopping motions parallel to but into the edge of the log to whittle it down. This will produce a log of chips and longer thin pieces, but will also thin out the log, making it easier to ignite. Ultimately, a camp hatchet simply isn't built for splitting tough wood. Bring a maul or buy softer wood. Not the answer you're looking for? Browse other questions tagged gear safety firewood or ask your own question. Is Permethrin safe for cats after it dries?